When it comes to Docker containers, the smaller, the better. When it comes to Docker containers, the smaller, the better. Smaller containers are easier to work with, deploy faster, and tend to have fewer security vulnerabilities. This piece is part of a larger series on [Engineering for Site Reliability](/series/engineering-for-site-reliability/), specifically _Docker_. I worked at WePay during the transition from a monolithic application in the datacenter to a series of microservices running in the cloud. I spent a lot of time working on the Vagrant-based CentOS development environment for the monolith, and also started maintaining a custom CentOS base image in Google Cloud. As we were all learning about Docker, images, containers, and how it all worked together, the director of DevOps declared (unilaterally) that we should create Docker base images for the various languages we were using (PHP, Python, Java, Go), and they should all be built on a core CentOS 7 Docker image. Having a base disk image for our hosts that builds-in all of the shared functionality we needed. Having a base Docker image that every application referenced with FROM in their Dockerfiles which included shared patterns for logging and metrics. Having an optimized image for specific languages made it easier for developers using those languages to rapidly spin-up new application containers. But there were also some major drawbacks to this approach. Developers wanted to run composer install and pip install requirements.txt from inside the container. This often required development dependencies to be installed in the containers. One of our Java micro-service applications (CentOS 7 + Oracle Java + application code + development dependencies) clocked in at 1.8 GB. Our build system was frequently buckling under the weight of caching and transferring large Docker images between its cluster and our Artifactory installation. Now, some of this can be chalked up to learning a new technology. Some of these are growing pains that were incurred at the same time as chunking apart our monolithic PHP app into Java/Python/Golang microservices. Some of this was hubris by people who made unilateral decisions. But we’d made it to the cloud. We’d made it to microservices. And I’m sure that WePay’s development practices have improved greatly over the last couple of years since I left. In my current gig, my team has gone all-in with Docker, the AWS cloud, Infrastructure-as-Code, CI/CD practices, and the SRE support model. I’ll spend some time talking about these other topics in a future post, but I do want to talk about some process magic that makes it nearly effortless to deploy to Production multiple times per day with exceptionally little stress. Alpine Linux is the 5 MB successor to Busybox, which provides a few additional tools to Busybox’s 2 MB image size. Generally speaking, you should always use Alpine Linux. I use the word “generally” because there are certain exceptions to this (otherwise) strong recommendation. The most important of which is that while larger Linux distributions which use the GNU’s glibc library for the C Standard Library implementation, Alpine, Busybox, and others use a different library called musl. You can take a look at the differences between musl and glibc, but the part that matters to you is that there is some software that exists which depends on the non-standard parts of glibc that haven’t been implemented in musl yet. What this means, practically speaking, are that things like the %P marker for strftime() doesn’t work as documented. Docker images use layers to overlay newer changes over previous changes using a technology called UnionFS. This works similarly to Git, where all of the changes that ever happened are still inside the repository, but when you pull the master branch, you’re pulling down dozens (or hundreds, or thousands) of layers that all need to resolve into the current state of the branch. With Docker, each of these layers is introduced by the RUN statement inside a Dockerfile. Unfortunately, many people (including myself) read that Docker image layers have filesize overhead built into them. In order to make your containers smaller, you should combine all of your commands into a single RUN statement. The side effect is that any time you need to change anything inside that RUN statement, Docker needs to rebuild everything from scratch — since it’s all in the same layer (which changed). By leveraging the RUN statement as it was intended, you get to take advantage of faster re-build times by leveraging the layer cache. This means that any layers (e.g., RUN statements) which haven’t changed since the last build do not need to be built again! Yes, your development Docker image may be a little larger, but we will address this later in this post. This is the one that kills me the most because it can be so wasteful, and it stems from not understanding how to use the tools in your toolbox. Firstly, use a .dockerignore file. Again, this is very similar to how a .gitignore file works — you don’t need everything you use for development to end up inside your Docker image, so use .dockerignore to avoid development dependencies. Some dependencies need to build binaries for the OS they’re running inside of. For example, Node.js apps often rely on Oniguruma. Many Python applications rely on MySQLdb. Both of these require that you install compilation tools and compile them on the OS that they run in. Some companies solve this problem by installing GCC inside the Docker image. A better solution is to have build-time and run-time dependencies, wherein you uninstall the build-time dependencies once you’re done with them. Here is an example of a PHP app that includes Redis support and installs the New Relic agent extension. # Needed at build-time, then can be uninstalled. # Should remain inside the container for runtime purposes. # PHP extensions to install. # Update the packages in the container to their latest security patches. # Install your build-time and runtime dependencies. # and `.persistent-deps` that we can refer to later. # Install the PHP extensions we need from the PHP repository. # Install the New Relic agent extension for PHP. # Install the phpiredis extension for PHP. # Uninstall the grouping of dependencies called `.build-deps`. Flattening your images is an extra step that you can take to make your images as small as possible. This is particularly useful if you are building/providing base images for other people to consume downstream. We can use this mechanism to flatten and shrink a Docker container. If we save an image to the disk, its whole history will be preserved, but if we export a container, its history gets lost and the resulting tarball will be much smaller. By running a container and exporting the data as a tarball, you can remove all of the intermediate layers and history from the final image, removing filesize overhead and reducing the overall image size. At the time of this writing, the latest version of PHP is 7.2.8 (actually, 7.2.9 was cut yesterday, but the updated image hasn’t been released yet), which builds on top of the Alpine Linux 3.7 image. The Alpine Linux image clocks in at just under 5 MB. The PHP image adds a few layers, and brings things up to 78 MB. So far, both of these are smaller than the base CentOS or Ubuntu images. Our application includes the New Relic agent for PHP, a few extensions, our application code, and our Composer vendor directory (without dev-dependencies). We should remove things like tests from our vendor directory, but we haven’t done that yet at the time of this writing. With all of our (wonderfully cached) layers, this brings the decompressed image size to 408 MB. After stripping out the history and removing all of the individual layers from the image (via a process called flattening), our final decompressed image size is a mere 197 MB in size. When you push your image up to a Docker registry (e.g., Docker Hub, Amazon ECR, Google Container Registry, Quay.io, Artifactory), the images will be compressed. Our final Docker image, compressed-at-rest, is only 72 MB. A small, 72 MB Docker image for our application is small and easy enough to push into our CI/CD pipeline in only a few seconds, and puts very little network or storage strain on our internal systems. It’s fast to download into my local development environment, and every step of the development and build processes are automated. Over my career, I’ve observed that engineers view the topic of “security” primarily through the lense of their job role. Application engineers tend to view security as things like XSS vulnerabilities and SQL injections. System engineers tend to view security as things like CVEs and intrusions. In this context, I’m referring primarily to security vulnerabilties along the lines of Heartbleed, ShellShock, and httpoxy. Because there is so little software installed by default, the attack surface is substantially reduced — oftentimes to the point where there are zero known vulnerabilities anywhere in your application container. 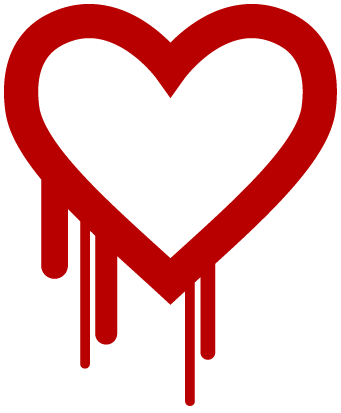 Logo for the Heartbleed vulnerability. This is entirely unheard of in CentOS, Ubuntu, and other larger distributions. As a matter of fact, when our application went live and we underwent review with the security team, they scanned our hosts and containers with zero unpatched vulnerabilities and thought that the scan was bad or their software was broken. Big Docker images are a bad thing. Flatten your images if you’re sharing them. The less software that is installed, the fewer security vulnerabilities there will be. Making your images as small as possible can greatly reduce the burden on the rest of your infrastructure.